Commercial developments required to comply with storm water management and hardcover reduction standards finally have an option…permeable pavers, pervious asphalt, and porous concrete. An increasingly popular alternative to traditional non-porous surfaces, eco-friendly permeable pavers absorb water, reducing the number of contaminants that run off into groundwater or other water sources. However, to work effectively, the pavers require special cleaning that not many sweeping and pressure washing companies can provide. Twin City Sweeping is one of the few who do. Twin City Sweeping is proud to be chosen by Borgert, a Minnesota manufacturer of premium interlocking permeable pavers, as the preferred cleaning vendor of permeable pavers nationwide. 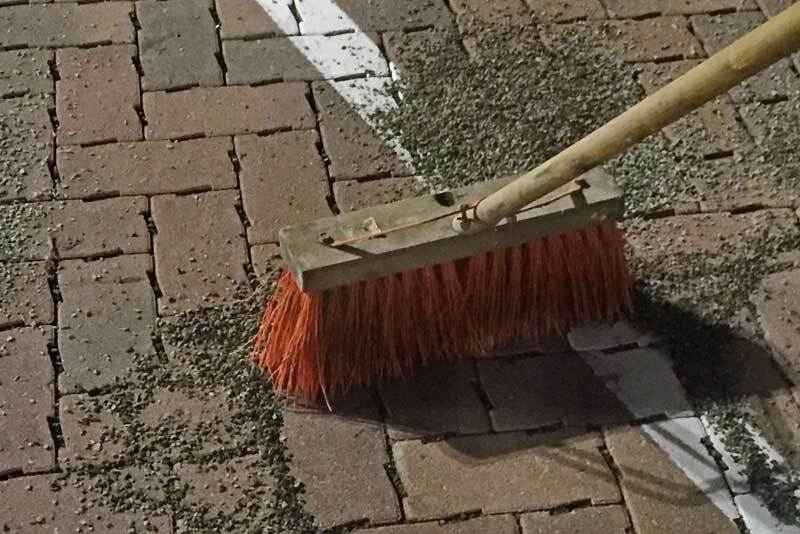 In addition to permeable paver cleaning, Twin City Sweeping can sweep commercial lots and surfaces, pressure wash garages and ramps, paint line stripes, and even paint signs and symbols — saving you the hassle of coordinating with multiple vendors. Most importantly, we never sub out our work to contractors. When you call Twin City Sweeping, you get Twin City Sweeping. Routine maintenance to remove the sand, silt, and other debris so the system continues to filter storm water. Deep clean to restore percolation on plugged surfaces. We top off the surfaces with granite chips which keeps debris on top of the pavers, preventing clogs and ensuring the system is ready for the next storm. Contact Twin City Sweeping today for a free estimate or to schedule permeable paver cleaning for your commercial space. Preferred experts in the metro area for maintenance and restoration of your permeable pavers, pervious asphalt, or porous concrete.